Whether the weather has a lasting impact on an outdoor event is often not unknown as it is happening. 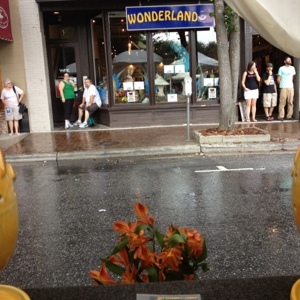 We are in about 2 inches of rain right now at our booth at Bele Chere in Asheville NC. We were told to button down the hatch! We can see from our phone radar that it’s red and coming. But we can handle gusts of 40 mph. Hail isn’t fun and that may occur but it’s already diminishing as I write. For all practical purposes the show must go on and it will! See you there!